Typhoon MAN-YI seemed to be weakened after passing Okinawa, but it recovered again, and is approaching Kyushu keeping its intensity. It made landfall at Osumi Peninsula around 14 JST. The rainfall by Baiu Front mainly in the southern part of Kyushu is so heavy that some places may not be able to stand for additional rainfall by the typhoon. Because of this heavy rainfall, I will start AMeRAS (AMeDAS Ranking Service) from today. The purpose of this service is to rank AMeDAS data from many viewpoints; for example, the present rainfall is ranked how much in history of that place, or how much among all AMeDAS stations? This service is still preliminary, but I decided to make it open in the hope that this service can help some people to understand the current situation. 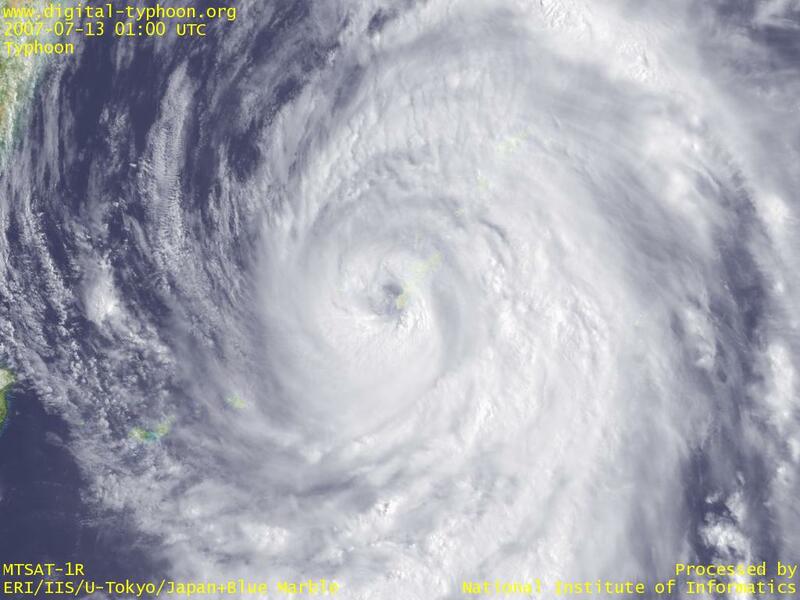 Typhoon MAN-YI is now passing near Okinawa Main Island. Checking AMeDAS data at Okinawa (Japan Meteorological Agency, in Japanese), the minimum pressure of around 940hPa was recorded at Naha between 09 JST and 10 JST, and the wind speed is also dropped at Kerama for this period, so these observations indicate that the typhoon has passed during this period. If you look at Google Earth version, the typhoon is estimated to pass between Okinawa Main Island and Kerama Islands. Some information about the current situation of those places can be found at Typhoon Front or Eyes on the typhoon. Typhoon MAN-YI has further increased its trend of intensification since last night. 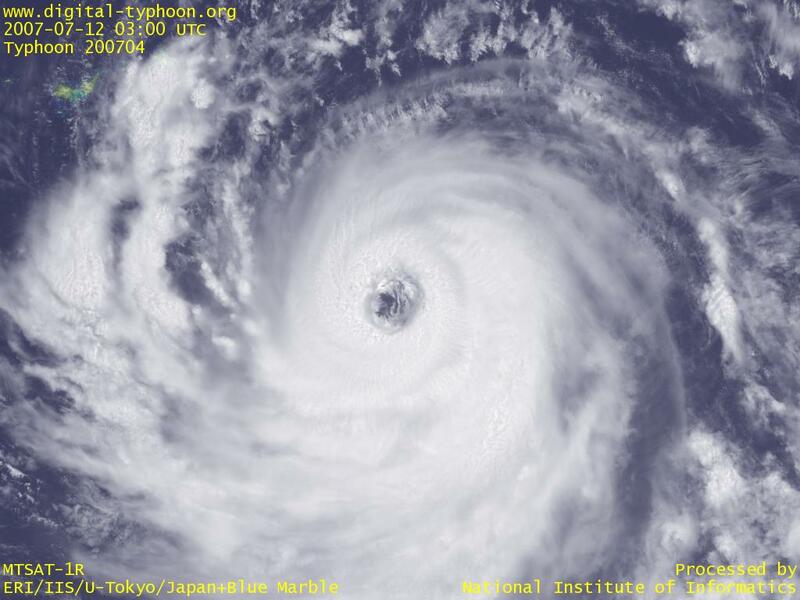 The eye of the typhoon is not like a pin-hall, but the eye looks very clear surrounded by very thick clouds, and this represents a large and powerful typhoon. 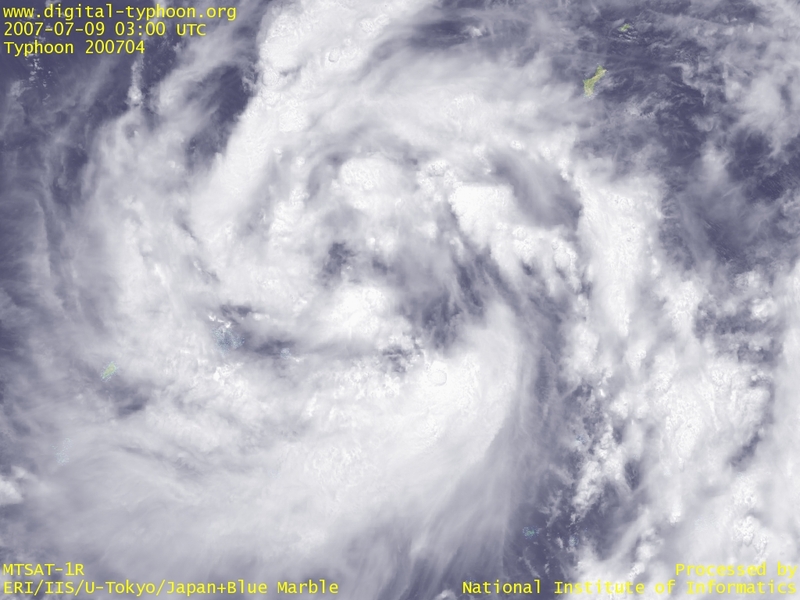 The typhoon is forecast to move from Okinawa Islands to Amami Islands along with a little more intensification. This means those areas will be struck by the typhoon with its peak intensity, causing extremely heavy rains and winds. Typhoon MAN-YI showed the imbalanced distribution of clouds yesterday, but it seems to enter into the second stage of development today; now it has dense clouds around the center and its eye is visible. Japan Meteorological Agency forecast steady intensification of the typhoon for a while. It seems that the current situation in south of Okinawa may not have strong factors hindering the intensification of the typhoon. Typhoon MAN-YI is showing steady intensification, but the clouds are not yet concentrated at the center, so it seems the typhoon is at a stage in which it tries many forms to look for future development. It, however, has gradually been organizing its cloud system, so it may move to the next stage of development after a while. 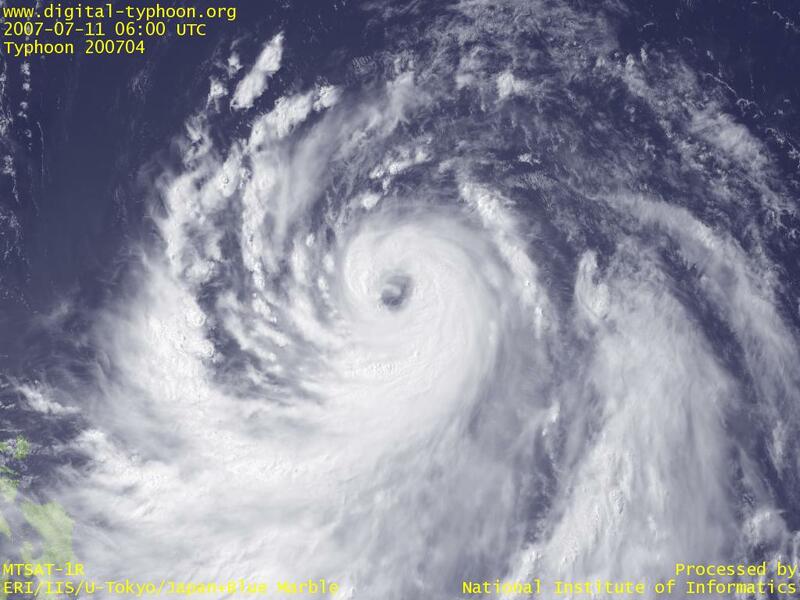 Typhoon MAN-YI has a large body, so this may be why the typhoon is gathering clouds slowly. 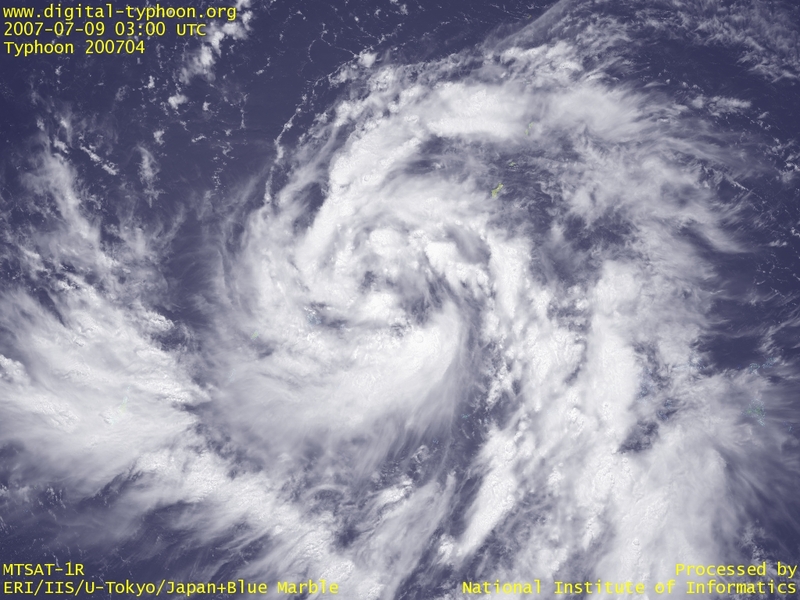 The tropical depression, before the birth of Typhoon MAN-YI, was formed about two days ago, and the clouds of the typhoon have been repeating organizing and dissipating periods. For that periods, however, the spiral shape of the typhoon is getting stronger, so the typhoon may intensify rapidly once the clouds are gathered at the center. Please be aware of the abrupt change of the status. By the way, we restarted the distribution of visible imagery since June 22, 2007. So we also would like to restart the distribution of wallpaper images that we were making before stopping the distribution of visible imagery. 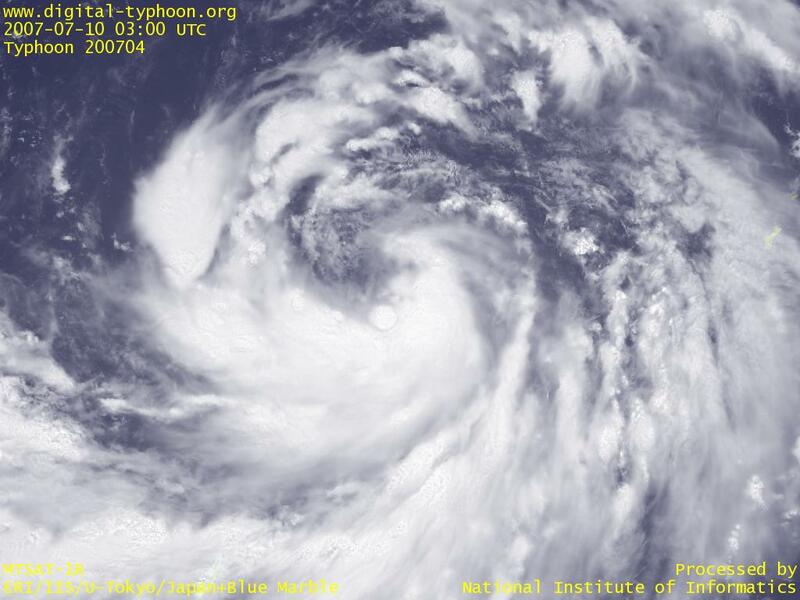 The wallpaper images below clearly show clouds around the center of Typhoon MAN-YI shortly after its birth. 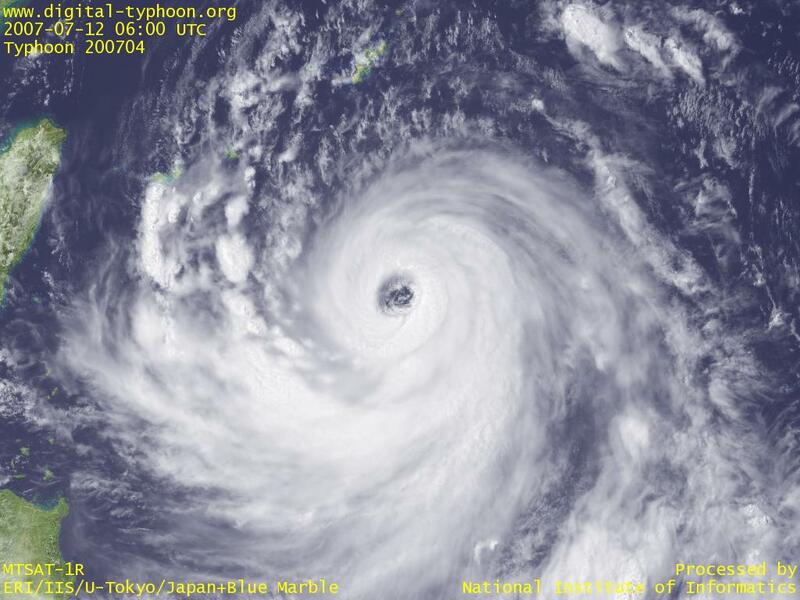 Typhoon MAN-YI was formed in Caroline Islands. Typhoon is moving westward, and Yap Island will be affected first. Japan Meteorological Agency, Joint Typhoon Warning Center, and others forecast steady intensification of the typhoon. The center of the typhoon is not yet fixed, but spiral cloud of the typhoon is well-balanced and widely extended that it is possible to see significant intensification in a few days as long as a good condition is met.